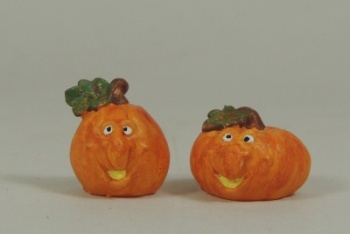 Cutest little pair of goofy pumpkins! I just love the faces on these pieces. Easy to paint, and they look great in cream with antiquing stain over them as well as the traditional orange color. Tall pumpkin measures 3/4" tall, small pumpkin, 3/8" tall.